My shoulder has been... unhappy for years. It's finally gotten to the point where I can't take it anymore and Something Must Be Done. To further this goal, I had an MRI today. Things to know about me: I'm vaguely claustrophobic. The idea of spending half an hour in an enclosed tube doesn't exactly give me warm fuzzies. In fact, it's rather a petrifying idea. I was willing to bite the bullet, though, simply because I'm tired of having a nonfunctional shoulder. In fact, this is a really good metric for how much it's bothering me-- is it bad enough to be worth an MRI? The MRI itself was an exercise in keeping my eyes closed and counting my breaths. Well, that and reminding myself that I could safeword at any time just by squeezing the ball that was in my left hand. Doing that would only prolong the exercise, though, so I kept telling myself that I'd wait just one more minute before I did that. OK, just one more minute. One more minute. Listening to the patterns of the MRI is sort of trippy and sort of musical, and that kept part of my brain distracted from the "OH MY GOD WE'RE STUCK!" sensation. I actually did have her pull me out of the tube at one point, but that was because my right hand had gone numb, and not because I couldn't take the tube. At the end, I asked if I got to see the images. "I can burn a CD for you. I'll do that while you're getting dressed." Goody! 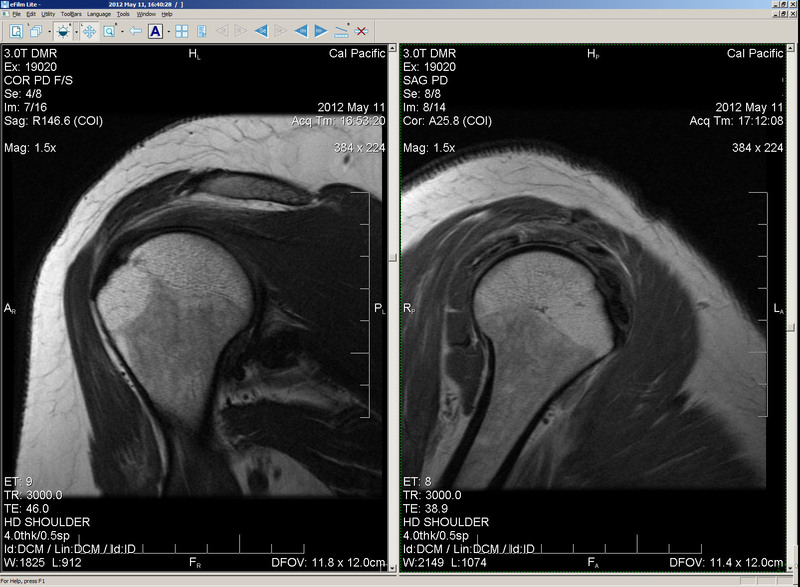 Of course, I have no idea how to read an MRI, but I've spent the last hour with images of my shoulder in one window, and a Google search for "shoulder MRI" in the other. I still know nothing, though I think I see some fluid in the joint from certain angles. Wanna see? Here's the inside of my right shoulder. The left image is a front view, and the right one is a side view. I decided to spend the evening drinking sake, eating cheese, and making gougeres. Hic! I'm not at all claustrophobic, and I had a horrible experience with my one MRI as well. I did make them pull me back out - fortunately they had most of the images they were after. They also seemed quite put out that I safeworded, even after assuring me at the beginning that I could do so. It's pretty much the only time in my life I've been anywhere near that claustrophobic. From the handful of folks I've talked with about having MRIs, apparently it's not an uncommon experience. I'm sure it's quite common. She was actually quite good about it and about checking in to be sure that I was OK. She also guided me through it as much as possible, by telling me how long the next scan would take and sometimes how many I had left. She offered me a towel to put over my eyes before I went in, but I decided I'd rather be able to open my eyes if I wanted to. I did a few times. When I said that my hand was falling asleep she pulled me out between scans, but asked me to be careful not to move my shoulder. I wiggled my fingers and she changed the padding around my arm. It wasn't a horrible experience for me, though it was certainly an unpleasant one. I was basically just bottoming, and I know how to do that. Hrmm. My doctor has a lot of patients from the kink community. I bet that a lot of them are really good patients, and a lot are really horrible ones... I'm sure it's more polarized than for a typical doctor's practice. When I fell last summer, I had continuous shoulder pain through the fall. An MRI-arthrogram (dye injected into joint; pretty painful) was ordered. Had to have an MRI w/o dye, then an MRI w/dye. It sucked. Anyway, I had a small rotator cuff tear. I improved with PT. But I learned that most adults get rotator cuff tears as they approach middle age. Most of the tears eventually merit some sort of surgery. I hope you don't wind up in that situation. Yup. Shoulders look like dinner to me. *shrug* When I looked at my pre-surgery MRIs in 2009 I was all I'M MADE OF STEAK! I've had a bunch of MRIs, for back and shoulder. Every time I have one, I fall asleep. I just like the sound of machinery, I guess.